India Inc is on a roll. After claiming the second spot in the Regus Business Confidentiality Index 2012, the Pew Energy report recently announced that private investment in clean energy in India increased by 54 percent in 2011, which amounts to 10.2 billion dollars. This places India at the sixth spot amongst the Group of Twenty (G-20) nations. Clean energy is another name for renewable or alternate energy. 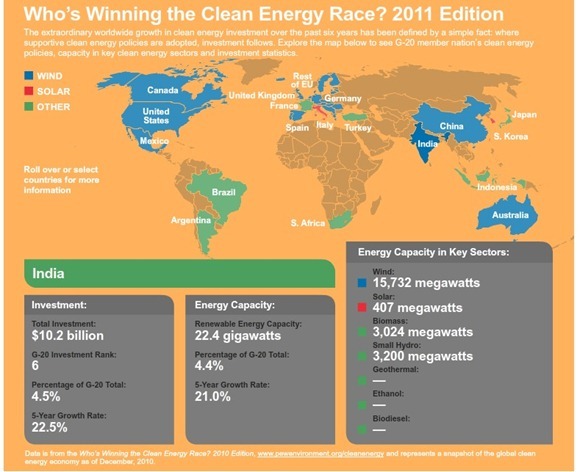 What places India amongst the top clean energy economies of the world? The Pew report stated that India is the one of the top performing clean energy economies in the 21st century. The report recorded the fifth highest 5 year rate of investment growth and eighth highest installed renewable energy capacity in India amongst G-20 nations. So, what made India tick? The report stated that India’s National Solar Mission led to a 7 times increase in solar energy investments. The aim of this mission is to generate 20 gigawatts of solar power 2020. This led to an increase worth of 4.2 billion dollars. India received 4.6 billion dollars as private investment and an additional 2.8 gigawatts worth of capacity was installed through 2011. The report noted that India is now richer with 22.4 gigawatts of installed clean energy generating capacity. 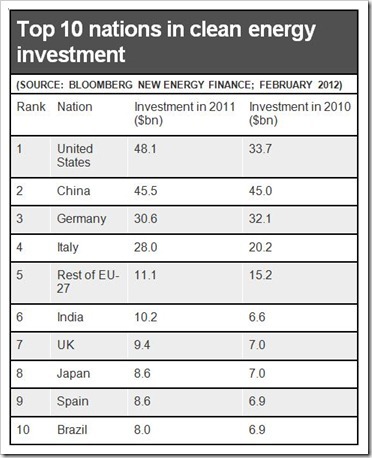 US claimed the top spot, having attracted a whopping 48 billion dollars worth of investment for the clean energy sector. China followed the top league by having the largest amount of wind energy investments and solar manufacturing. Germany ranked third with a total of 30.6 billion dollars of investment. The report gave an interesting insight on the difference in which both America and China attracted investment. China attracts investment by its green energy policies to reassure investors, by deploying renewables, manufacturing them and exporting them, BBC News reported. On the other, United States offers tax breaks. The report also went on to confirm that Germany officially obtains more energy from renewable sources than it does from nuclear power, coal or natural gas. The report further stated a few reasons that could be determinants of accelerating installation of clean energy generating capacity worldwide. Falling prices of photovoltaic modules was stated as being the most important of them. If India continues its competitive spirit of increasing the use of alternative and renewable energy, it could easily join the ranks of nations like Germany who are now replacing their use of traditional energy with alternative sources of energy. But just like every other change takes time to percolate within the Indian economy, the use of renewable and clean energy too, may take a while to reach the common man. Here’s hoping that more projects like the National Solar Mission are sanctioned and implemented by the Government. And the aim should be to not just enter the top league of a ranking or a report, but to truly make a difference to the environment. Top 5 Companies Using Renewable Power!